His novels tell of brutal murders and bad people. Was it just his imagination? Jerry Grey is better known as crime writer Henry Cutter - whose twelve books kept readers gripped for over a decade. Now he's been diagnosed with early onset Alzheimer's, and his writing life has ended. But the stories haven't. As his control loosens, Jerry confesses his worst secret: the books are real. He remembers committing the crimes. His friends, family and carers say it's all his head. He's just confused. If that's true, then why are so many bad things happening? Why are people dying? This is a superb psychological thriller that raises the bar for quality crime writing, then leaps over it. 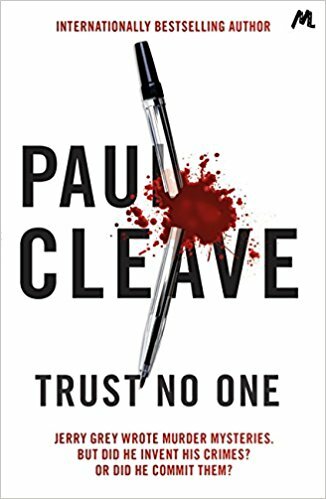 Paul Cleave's ninth thriller, which racked up acclaim from critics and crime writers alike the past couple of years and won the 2016 Ngaio Marsh Award for Best Crime Novel, has finally been published in the UK. Good news for crimelovers; it's head-spinning-ly brilliant, must-read stuff. International bestseller Paul Cleave is the Crown Prince of antipodean crime writing. A New Zealand author who's among the best on the planet for twisted tales of characters who have a pretty askew view of the world. Trust No One earned him a third Ngaio Marsh Award for his resume (which also includes a crime writing prize in France and nominations for the Edgar, Barry, and Ned Kelly Awards). He's up there with the very best in the business, while being quite unique and distinctive. And Trust No One may be his best book yet. It's a fascinating, chilling, disturbing tale. Cleave takes us deep into the confusion, anger, and frustration that Jerry feels as he's stricken by 'the Big A'. Switching between Jerry's contemporary thoughts and his 'Madness Journal' that he begins writing to his later self, Trust No One has readers as confused as Jerry. We feel for him, and we feel like him. There's a unique usage of second-person narrative in the book, amongst the switching perspectives, but Cleave marries it all together seamlessly. Things are repetitive at times, with little twists and differences - intentionally so, mimic-ing what is going on in Jerry's own life and mind. Jerry is the ultimate unreliable narrator. The storyline powers along, with tension and twists aplenty. Cleave's prose has a sly electricity - vivid and vicious, with underlying humour and heart. A page-turner that's much more too. Overall, Trust No One is superb, top-notch, top-shelf thriller writing. Grab a copy.